The UK's Advertising Standards Authority recently upheld 53 complaints about a Nutella commercial that tried to spin Nutella as healthy and good for children. "Surprisingly, each jar contains 52 hazelnuts, the equivalent of a glass of skimmed milk and some cocoa"
"Nutella releases energy slowly, so it can be part of a balanced breakfast"
Wow, do the math and you'll find that along with the 52 hazelnuts, each 400g jar of Nutella contains 60 teaspoons of sugar (that's roughly 1.5 cups of sugar - the same amount you'd find in 2 litres of Coca Cola (for the Americans, that's half a gallon)). 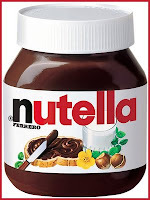 "We took the advice of independent expert nutritionists who; based on the Food Standards Agency "Eat Well plate" nutritional guidelines determined that Nutella Hazelnut Spread could form part of a balanced breakfast"
Made for Canada translation? The Food Guide made us do it. What does Nutella Canada have to say? "Mom's across Canada choose Nutella as part of a nutritious and delicious breakfast to give their kids a great start to their day! Nutella combines the magic of these ingredients into a unique and yummy recipe that kids love. And with no artificial colours and no preservatives, it's easy to feel good about serving Nutella to your kids and helping them spread some energy"
I guess "energy" is Big Food speak for "sugar".